on the Alabama Department of Revenue’s website at www.revenue.alabama.gov. 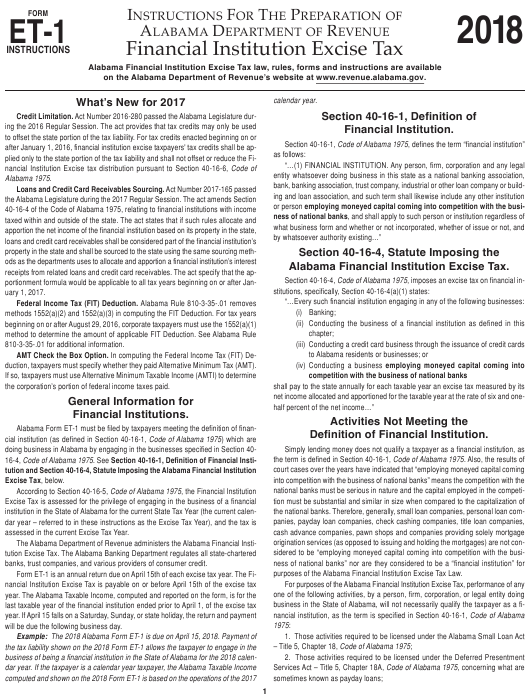 Alabama Financial Institution Excise Tax. duction, taxpayers must specify whether they paid Alternative Minimum Tax (AMT). the corporation’s portion of federal income taxes paid. assessed in the current Excise Tax Year. banks, trust companies, and various providers of consumer credit. purposes of the Alabama Financial Institution Excise Tax Law. will be due the following business day. censing Act – Title 5, Chapter 25, Code of Alabama 1975. Form 4797, and balance sheet information. empt from the licensing requirements). idate amended changes, and computation of additional amount due or refund due. tion of “financial institution” as specified in Section 40-16-1, Code of Alabama 1975. Annual Consolidated Filing Election and Fee. not the provisions of the Alabama Financial Institution Excise Tax law. Alabama, and the nature of business being conducted in Alabama. the block, and enter the name and FEIN of the common parent corporation. a consolidated financial institution excise tax return. If a notification of Final IRS change is attached to the return, check the box. Extension to File Alabama Form ET-1. specified in Section 40-16-3, Code of Alabama 1975.
mated tax due must be remitted with the extension request on or before April 15th. if the taxpayer will not file as part of a consolidated Alabama financial excise return. the apportionment percentage (has operations in Alabama and one or more states). payments of $750 or more electronically. have received prior permission from the Alabama Commissioner of Revenue. liability due should be remitted no later than the original due date of the return. ments of $750 or more. Substantial penalties will be assessed for noncompliance. icon on the home page). structions on filing a Consolidated Financial Institution Excise Tax Return. Complete lines 1 through 31, and attach detailed schedules as needed. quent and/or frivolous return penalties. (net income is referred to as Alabama Taxable Income on the Alabama Form ET-1). tionment of the net income (taxable income) for a taxable year. lowable for the amortization of start-up expenditures in accordance with 26 U.S.C. pense which is not chargeable to a capital account in accordance with 26 U.S.C. plemented by the Economic Stimulus Act of 2008. LINE 16 – Advertising. Enter the deduction for advertising. ding Dividends Received Deduction (which would be properly deducted on line 18). LINE 3 – Rental Income. Enter the amount of rental income. sion, profit sharing plans, etc. and amounts totaling the amount entered on line 5.
enter the total on line 6. LINE 7 – Compensation of Officers. types and amounts of deductions claimed on line 19. LINE 9 – Repairs. Enter the amount of repairs. tions) from line 6 (Total Income). bad debts using the reserve method, in the discretion of the Department of Revenue. come is entered as a negative amount in computing total apportionable income. come or (Loss) and line 22 (Net Nonbusiness (Income) or Loss). 26, Schedule L on page 4.
ing line 23 (Apportionable Income) by line 24 (Alabama Apportionment Factor). LINE 11 – Rent. Enter the amount of rent expense incurred. Alabama Financial Institution Excise Tax or any taxes taken as a credit on line 33a. The federal income tax deduction must be taken only on line 28, not line 12.
come or (Loss) Allocated to this State). cordance with Internal Revenue Code §§163, 264 and 265.
federal income tax deduction or (refund) from line 12, Schedule M on page 4.
must be paid during the taxable year. operating loss being claimed in the current year may have been utilized. from line 27 (Alabama Income before Federal Income Tax Deduction). the amount entered on line 12, page 1. Attach additional schedules as needed. to the return, this box must be checked. return must be checked in addition to being notated in this section. Section 40-16-4, Code of Alabama 1975.
directed to the Corporate Compliance Section at (334) 242-1200.
as an extension payment with Form ET-8. Schedule K – Allocation of Nonbusiness Income, Loss, and Expense. claimed on lines 33a, 33b, and 33c. ceed 25% of the tax amount shown due on the return. Beside the line number in Schedule K, enter the item description. Alabama interest rate is the same as provided for in IRC Section 6621. In Column B enter the amount of gross income or loss allocable to Alabama. income and in fact may exist when there is no nonbusiness income. tract Column D from Column B, and enter the remainder in Column F.
total of Column E to page 1, line 22. Carry the total of Column F to page 1, line 26.
will be distributed for the tax year. cate that no such office exists in Alabama. tor of each of these factors. not secured by real property. LINE 15. Enter in the appropriate columns the net gains from the sale of loans. card receivables and fees charged to card holders. the purchase, in whole or in part, of such extension of credit from another or both. LINE 19. Enter in the appropriate columns receipts from merchant discount. from loans secured by real property. outstanding principal balance, without regard to any reserve for bad debts. from loans not secured by real property. net gains, and other income from investment and trading assets and activities. how the receipts are reported on the federal income tax return. – Other real and tangible personal property. LINE 5 – Totals. Enter in each column the totals of lines 1 through 4.
bama column for lines 11 through 24. Everywhere column for lines 11 through 24.
where columns, and then dividing each by 2.
enter the percentage on line 25c. percentage here and on line 24, page 1.
of Year columns represent the capitalized rental value. and 7 in the Alabama End of Year column. fund received in the taxable year. and 7 in the Everywhere End of Year column. the company filing Form ET-1. Everywhere), and enter the percentage on line 9.
were subject to the federal Internal Revenue Code. (AMTI) to determine lines 1 and 2 or line 6 below. line 30 or 31 of the proforma 1120.
amount in line 10b and enter the percentage on line 10c.